This is where Clyde Tombaugh discovered Pluto, the place where the three largest known stars were identified. Today, it searches for near-Earth asteroids and planets in other solar systems. The Lowell Observatory is an important historical location (they’re proud of their position of #73 in TIME’s list of “Civilization’s 100 Most Important Sites”) and continues to contribute to our knowledge of the universe. The observatory is located at the top of Mars Hill at an elevation of 7,200 feet, so if you decide to visit, bring your walking shoes. Though Lowell is a site of ongoing research—the Discovery Channel Telescope was only commissioned a few years ago—it is also open to the public, and offers plenty to see and do. Visitors can take any of several guided tours. Come during the day and you’ll be shown around the Rotunda Museum, which not only contains displays on moon-mapping and the founder’s fascination with the planet Mars, but also is home to an early computer known as “The Millionaire” and an enormous slide rule that’s 60 feet long when folded up. Another tour focuses on the Pluto Discovery Telescope itself and the story behind the dwarf planet’s first sighting. Visit during the day and you can stare right into the sun through a telescope designed for such purpose, or make an evening climb and encounter the panorama of the stars. Multimedia presentations involve a documentary on the creation of the DCT and SlipherVision immersive space theater explorations of the scale of the universe and the constellations. Special events every week or so involve science demonstrations and special telescope-viewing nights. Once-a-month day camps for preschool and kindergarten children and week-long summer camps for elementary-aged and middle-school kids are offered, as well. 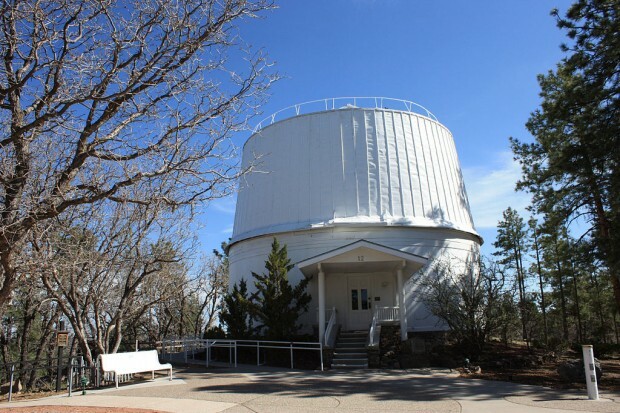 The observatory can be found at 1400 West Mars Hill Road, Flagstaff, AZ 86001.